To me, some of the coolest kinds of movies take subjects that seem completely normal and uneventful and completely flip them on their heads to show a much more unsettling look at normalcy. In 1999, director Sam Mendes graced the world with a masterwork of film making, American Beauty, which took a darkly comedic look at the sometimes tragic follies of suburban living. After this great success, Mendes would revisit similar themes with his 2008 film Revolutionary Road. While it does share similar elements to his earlier film, Revolutionary Road is a much more serious and unsettling look at marriage, mental health, and the idea of “settling down.” It’s an overwhelming experience that is bound to leave you drained by the end. 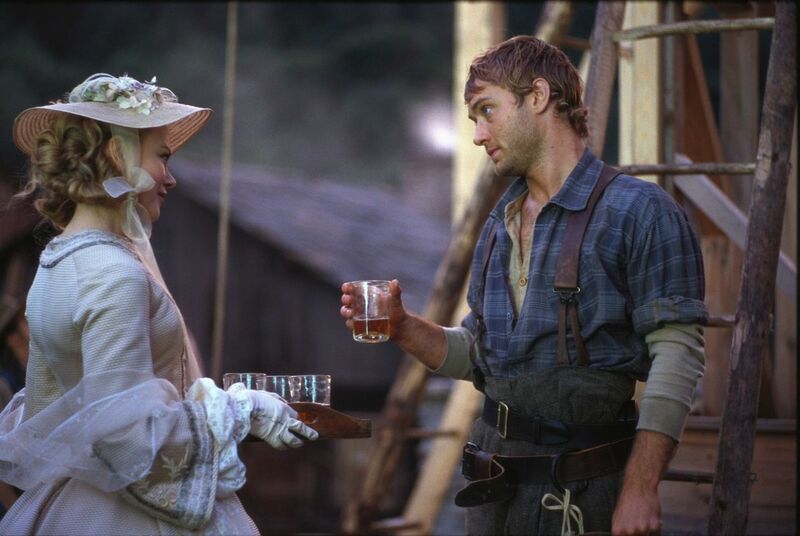 After Frank Wheeler (Leonardo DiCaprio) meets April (Kate Winslet) at a party, it doesn’t take long for them to fall in love and start their life together. They move into a nice house on Revolutionary Road in the suburbs of Connecticut. Frank gets a job as a salesman for Knox Machines and April stays home taking care of their two young kids. It seems like the perfect nuclear family. What’s happening behind closed doors is less than perfect. Frank and April’s relationship is completely disintegrating, and this disintegrations is causing a lot of hate to boil to the surface. This hate has to remain hidden from their friends and neighbors. Their final solution to this is to pack their things, get out of the mundane life they created and move to Paris. While this idea brings them closer to the happiness they desire, a promotion offered to Frank once again puts their relationship in jeopardy as their desires and feelings become even more at ends and their lives begin to spiral out of control. What Mendes did for more modern suburban life with American Beauty, he does for the nuclear family in Revolutionary Road. This film takes a tough look at what is labeled as the “perfect American life.” The Wheelers are a close family that live in a nice house in a nice neighborhood, and that’s ultimately what seems to be their downfall. Everything is just too nice. It also shows the long term consequences of decisions that seemed like a great idea at the time, like quickly getting married or hastily taking a job that you have no interest in. I feel like I’m rambling a little bit, but that’s one of the more interesting parts about this movie. Everything seems so mundane and ordinary at first glance, but this mundanity is what’s helping to tear this family to shreds. 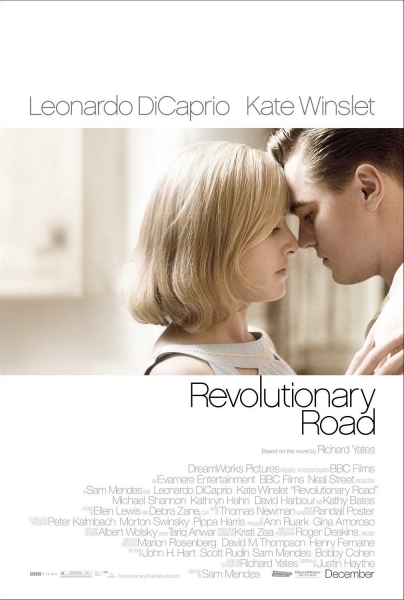 Revolutionary Road also takes a critical look at relationships. It doesn’t condemn them even a little bit, but it forces the audience to examine what makes them actually work and how too much focus on yourself, no matter how right or wrong you may be, can wreak the foundation a relationship is built on. In a nutshell, Revolutionary Road is a film about the extraordinary dark side to an otherwise ordinary life, which may seem all to real to some people. 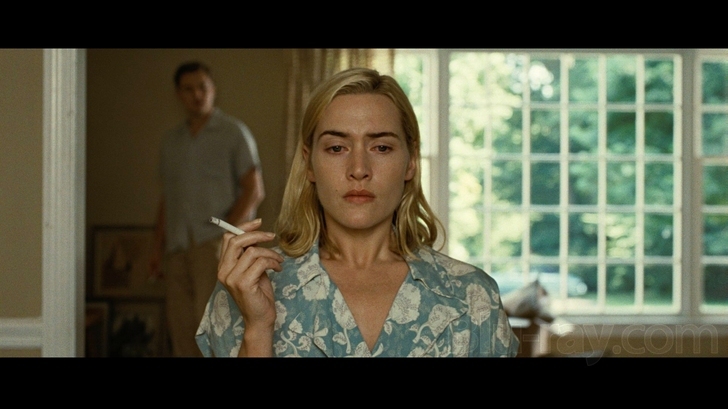 Revolutionary Road is an emotionally exhausting film, and I guarantee that by the end you’re going to need either eat an entire tub of ice cream or take a really long nap. There are scenes in this movie that are so intense and real and uncomfortable that I was looking at it through my fingers. When a movie isn’t a horror film and it elicits that kind of reaction, then something was done very right. While it is very intense and tragic in many scenes, there are times where it got to be a bit too much. That’s probably my only complaint with this film. It goes from being highly dramatic to too predictably melodramatic. This only happens a few times throughout the course of the movie so it really isn’t that big of a complaint at all. Most of the scenes hit the dramatic intensity just right, while a select few kind of just go too far. 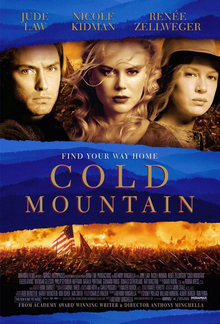 One major contribution to the drama is Thomas Newman’s excellent score that fits right in with the film’s onscreen action. Watching this movie, it isn’t hard to believe that before working in film, Mendes was a prolific director of stage plays. He, along with the help of master cinematographer Roger Deakins, films this movie like something that could be found on stage. It works great for the film and really allows that actors to work with the limited space that is given to them DiCaprio and Winslet have already shown their chemistry in Titanic, and now show a much more matured version of that chemistry in Revolutionary Road. They give outstanding performances that, I feel, have become under appreciated since the time of this movie’s release. I was surprised to see Michael Shannon, who has grown to be one of my absolute favorite actors, shows up for a little bit. He’s only in a few scenes, but he absolutely owns the screen whenever he’s on, and for this small performance he was given a Best Supporting Actor nomination. Revolutionary Road is one of those movies that really hits you where it hurts. At times, the drama could get a little heavy handed and the writing could stray into the “no one really talks like that” category. Even with the rare heavy handedness, this is a really interesting and upsetting film that succeeds in exactly what it was trying to do. Not only is this film shot very well, but the acting is superb and the production and costume design really get you into the era that the film takes place. Mendes is a film maker that understands the more subtle terrors of normal life, and he uses them very well in Revolutionary Road. Regardless of what people may or may not think, it is completely possible for a film maker with some talent to create a really cool vampire movie. There has been enough tom foolery happening with vampire lore, that it sometimes seems too much to handle. 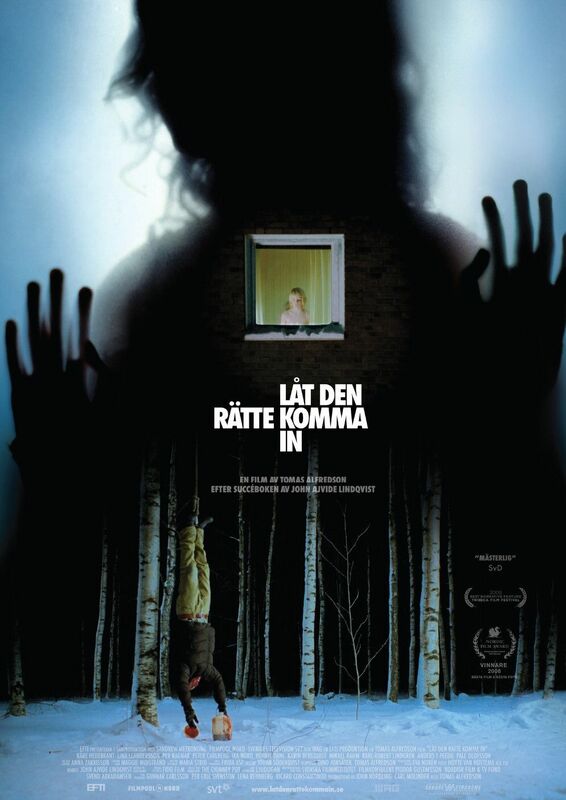 Enter novelist/screenwriter John Ajvide Lindqvist and director Tomas Alfredson who worked to create what may be the best vampire film of the last decade, Let the Right One In. It’s an outstanding blend of human drama, vampire folklore, coming of age, and romance but also will very likely remain a movie that I consider to be a modern day classic. Oskar (Kåre Hedebrant) is a 12 year old boy living in the suburbs of Sweden who has trouble letting out his hostilities caused by the constant bullying he is subjected to at school. Life for Oskar is shaken up when a mysterious young girl, Eli (Lina Leandersson), moves into the apartment next to his. The two children soon become friends, even though throughout the town there are brutal murders and disappearances occurring. As the two children become closer and closer to each other, and a small romantic bonds for between them, Oskar begins realizing some strange things going on with Eli, starting with the facts that she is way older than 12, has an unending thirst for blood, and may be responsible for all of the missing and murdered people around town. This is a movie that has so much going for it that it’s hard to just talk about it in so many words. I think it’s important to talk about some of the subtext going on in Let the Right One In. First of all, the way they handle Oskar’s character is brilliant. There are plenty of movies out there where a kid gets bullied, but in this one, we focus more on his time away from the bullies and how it is affecting him psychologically. Oskar spends his time clipping news stories about murder and guns before going outside to stab at a tree with a knife he hides under his bed. Much like another movie I recently reviewed, Gus Van Sant’s Elephant, this film deals with a mortal side effect to bullying. While we never see Oskar go to the extremes that are shown in Elephant, we do get a look at a boy who is slowly becoming more and more psychologically disturbed, which is just as terrifying, if not more terrifying, than any vampire you will see in any other movie. Despite what some people may want to think, vampires are very romantic creatures, even if the romance is in some form of creepy or unsettling way. Just look at Bram Stoker’s novel of Dracula. The romantic qualities of Dracula are certainly creepy, but he still seems to have a sort of power over women. In Let the Right One In, the romance is between 12 year old Oskar and the infinitely 12 year old Eli. This kind of romance is sweet to see and is also combined with a strange coming of age story for Oskar and a shift in the life of Eli. This is a much more interesting story than the murderous consequences of Eli’s thirst, although I can’t deny that this movie as some genuinely creepy moments that are guaranteed to make your skin crawl. This is a horror movie after all, but a horror movie that is devoid of those god awful jump scares. The horror in this movie feels legitimate, and not just something that gets your adrenaline fueled for a few seconds. Anyone who has seen this movie would agree that the climax of the film is one of the best in the history of horror films. Finally, this is a film that will get people talking. I first saw this movie in school, and pretty much only watched it as an interesting take on vampire movies. Watching it again just a few days ago, I saw how brilliantly written it is. There is just enough information given in the plot for us to know what is going on. I never really had any questions or confusions about what was being revealed, but there is so much happening beneath the surface that is merely alluded to that left me, and I’m sure many people, wondering. Now, I’ve never read Lindqvist’s novel, and from what I hear, a lot is explained. That’s fine for the novel, but for the movie, I love the mystery surround Eli and her past. It adds a whole layer of depth that wouldn’t be there if everything was simply explained. Let the Right One In is simply one of the best vampire films ever made and a personal favorite of mine in the horror genre. It retains an excellent feeling of terror throughout the whole film but also adds nice moments for the two children to grow closer to one another in a way that only children can. The performances by these kids are also both excellent and surprisingly believable considering who their characters are. I haven’t seen the American remake of this film, but I’m not sure I’m too interested in it. This movie is perfect enough as it is, and one that I could watch over and over again. In my travels here and there, especially on my adventures with public transportation, I’ve seen many a person reading books by the author Michael Connelly. A prolific writer, Connelly has created many different characters that are part of long running collections and also has worked on writing for film and television. 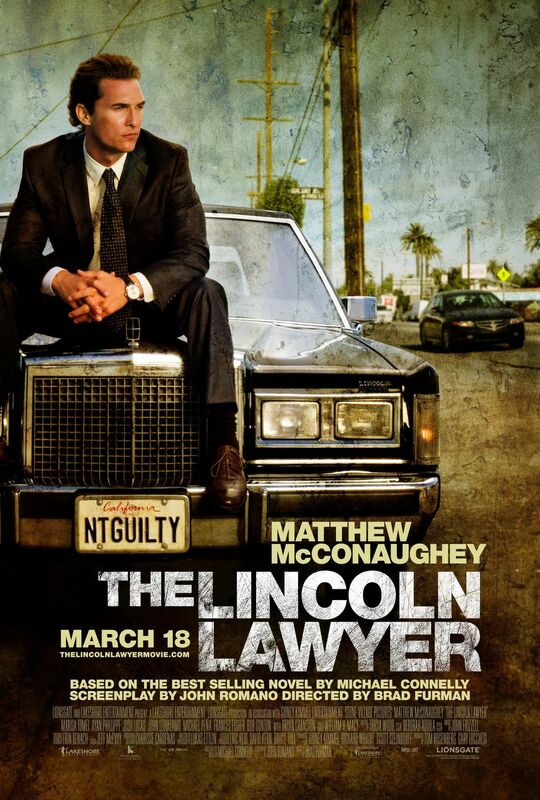 One of his most famous books was made into a movie just a few years ago, The Lincoln Lawyer, but when it came out I didn’t hear a whole lot about it. I thought it was about time to check it out and it’s fair to say that I got exactly what I was expecting from it. Mickey Haller (Matthew McConaughey) is a criminal defense lawyer who keeps his office in the back of his Lincoln Town Car that is driven all over Los Angeles. Haller’s willing to help anyone who’s willing to pay because all this job really means to him is a steady, and hefty paycheck, even though this way of thinking causes some minor conflict with his ex-wife and prosecutor, Maggie (Marisa Tomei). He soon stumbles onto a case that is sure to pay well when the son of a real estate tycoon, Louis Roulet (Ryan Phillippe), is charged with sexual assault and battery. At first, the case appears to be an open and shut deal, but when Haller’s own private detective Frank Levin (William H. Macy) uncovers some information about a previous case that may involve Roulet, Haller finds his career, his beliefs, and his life in supreme danger. I had some thoughts about this movie as I was going into it about what it was going to be like and what my reaction to it would be. It’s kind of crazy how on point I was about it, because while my assumptions either come close or are completely wrong, they rarely are this accurate. Going into The Lincoln Lawyer, I was simply expecting a good escape from everything for a few hours, and that’s exactly what I got. There’s nothing really excellent, nor does it ever go above and beyond what is expected. This is just a good movie through and through, especially since there’s nothing too big I really need to complain about. Let’s get the not so good stuff out of the way first. The movie as a whole feels like it should definitely be part of a series, almost as if this is the pilot episode to what is going to be an excellent show. There’s a lot of really cool characters introduced and the story is very intriguing, but by the end I felt like I needed to see more in order for the movie to finally feel over. Part of this is probably because this technically is part of a book series that probably later goes on to build the characters more, but part of this definitely has to do with a hasty ending that ends before it even gets started. I swear, the amount of content that is packed into the last fifteen minutes of this movie is unbelievable. It kind of suffers from Return of the King syndrome, that being there are a whole bunch of parts I thought the movie was over, and then it would just cut over to another scene filled with information. That’s the bad. Not really that much compared to everything else. The story of The Lincoln Lawyer, as I stated already, is really intriguing and the way it played out over a course of two hours was close to perfect. There was a lot of time for McConaughey to play a swaggering lawyer that appears invincible, and there was even more time for that image to peel away to show a distraught, morally torn human being. That being said, McConaughey and the rest of the cast do very well. Phillippe even gives a surprisingly good performance and I’m a little surprised I don’t see him in more movies. Everyone else does a good job, without acting better than is to be expected, but I just wish Bryan Cranston had more screen time! 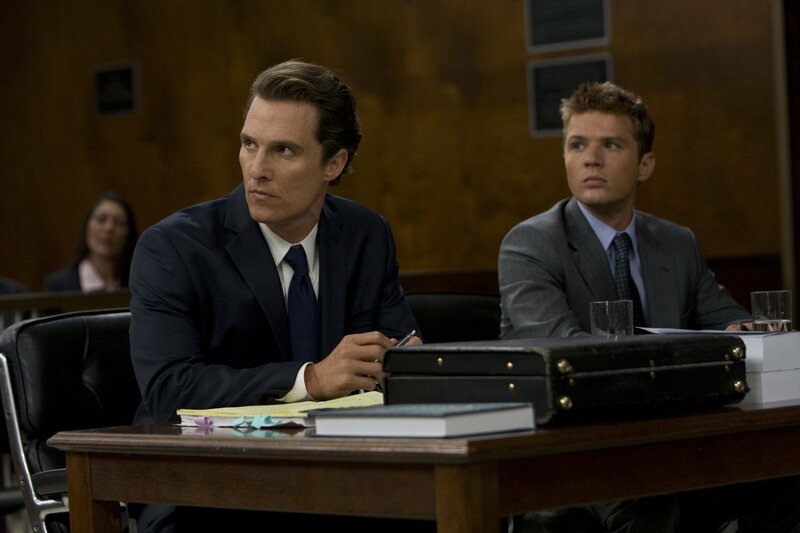 The bottom line is that The Lincoln Lawyer is a solid movie that won’t disappoint. Don’t get me wrong, though, it probably won’t impress you either. What we have here is pure popcorn escapism that just so happened to land on the good side of the film making spectrum. Everything, besides a rushed ending, fits very well together in this movie, but you have to make sure you suspend your disbelief the moment the movie starts. If you’re in the mood to just turn off and enjoy a few leisurely hours, this might just do the trick.